Microsoft and 343 Industries have announced a new Halo game, and it’s not going to be shackled to Xbox One, indeed it’s not coming out on the console at all. Halo Spartan Strike is a twin-stick shooter and spiritual successor to Spartan Assault. It’s due out on December 12th, and if you buy it for any device, be that your desktop or a tablet, you’ll unlock the game for all windows platforms – which is quite nice. 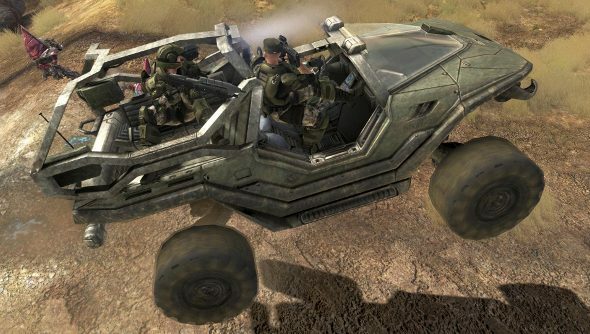 Spartan Strike takes place during the events of Halo 2, and while it’s a lot like Spartan Assault, it introduces things like the iconic warthog, which you can drive around in, shooting aliens, a new VTOL jet and the Prometheans. While it does appear to be designed more with mobile, touchscreen devices in mind, it won’t have microtransactions in any version. Our Tim was far from impressed with its predecessor, lamenting crappy controls, and how drearily repetitive it could be. “I’ve no idea why this exists, or why you would ever want to play it,” he said in his Halo: Spartan Assault PC review. However, some of his criticisms seem to have been dealt with this time around, as he really wished that both the warthog and Promethean enemies would have been in the game.